NVH track ace Ashley Sandall stormed to the top of the national 400m U17 rankings yet again when he won gold at the Birmingham Games on Sunday (Feb 16). Here's Ruth's report. Sandall shot to a new personal best of 49.51 at the National Indoor Arena, beating his closest rival by more than a second. The Dave Clay-coached 16-year old finished 9th in the national rankings last year, but will be aiming to maintain his top spot in his last year in the U17 age category. He said his training has been going very well, and feels confident for the upcoming outdoor season. There were three other NVH athletes in action in Birmingham. U17’s Alice Gibbon and Bethany Denial both competed in the high jump, where Gibbon jumped 1.45m to come 7th in her competition. Denial came 4th in the same event, jumping 1.50m, before recording a PB of 10.05s to come second in her 60m hurdles competition. 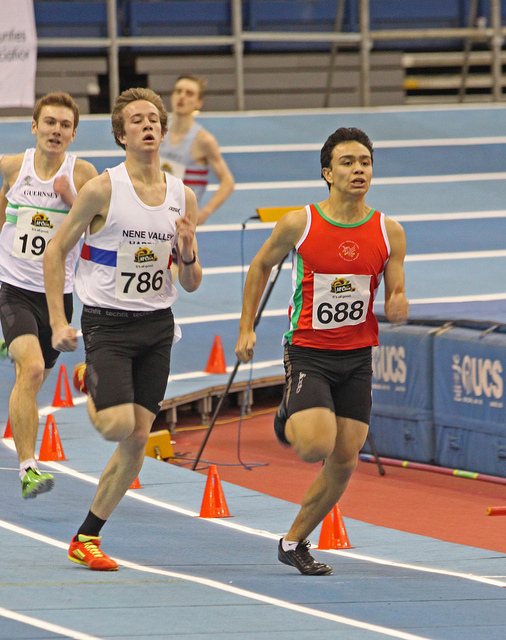 U20 Oliver Dilloway also achieved a PB when coming first in his 400m race with 52.44s.